Opportunity is a fleeting commodity in tennis. A player can either grab it or regret not latching on. 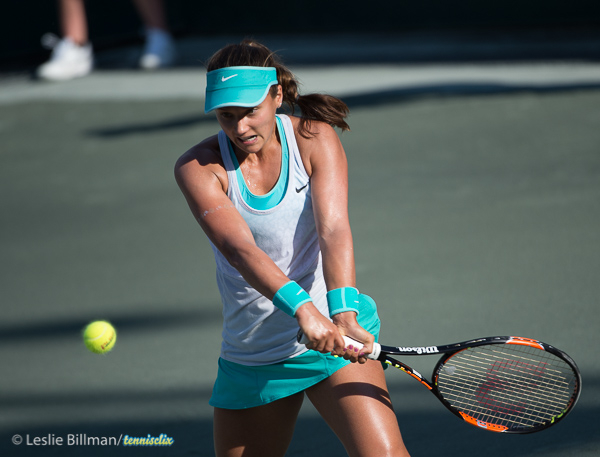 American Lauren Davis has grabbed hold of every ounce of opportunity here at Family Circle Cup, and is running fast into a career-best performance in the first clay court tournament of the year. “I’ve been working on taking the ball earlier, taking time away from my opponent,” Davis said after her third-round win over Mona Barthel, the No. 15 seed. Currently ranked No. 66, Davis is not of the Big Babe tennis variety, a term coined by veteran commentator and former tennis player, Mary Carillo. The youngster is at the opposite end of the measuring tape, standing at bout five-feet, two inches. Most might think her size would be a liability, but Davis is smart enough to put it all to use. She made headlines on Wednesday during her fast defeat of top seed and World No. 7, Eugenie Bouchard. Tennis pundits predominantly focused on Bouchard and her poor execution, flat footwork, and general ho-hum match attitude. What they missed was Davis’s drive, determination, and skill. Bouchard was the second Top 10 win for the Ohio native, the first being Victoria Azarenka at last year’s BNP Paribas Open. Davis has also adapted an aggressive stance on court right on the baseline. The reason? Taller players can have problems moving efficiently on this more slippery surface; changing direction means shifting their physical momentum. Bouchard may not have been at her best, but Davis was hardly bothered. She chose to exploit the liability, which can be tricky given the power game Bouchard is capable of. Defending champion Andrea Petkovic got through to the quarterfinals today, too, but felt the brunt of one last burst of energy from Madison Brengle before closing the match, 6-4, 6-4. Brengle is of similar stature to Davis, at about five-foot-four. She, too, uses her wheels to extend rallies and provoke errors from opponents. She did it perfectly against Petkovic at this year’s Australian Open, where she beat the German in the first round. Davis’ appearance in the quarterfinals will be her first. Her opponent, though, will be a familiar face — friend, Madison Keys, the tournament’s No. 7 seed. Keys made quick work of Andreea Mitu late on Thursday afternoon, 6-2, 6-0. Unlike Davis, the five-foot-ten Keys is a walking posterchild for Big Babe Tennis. 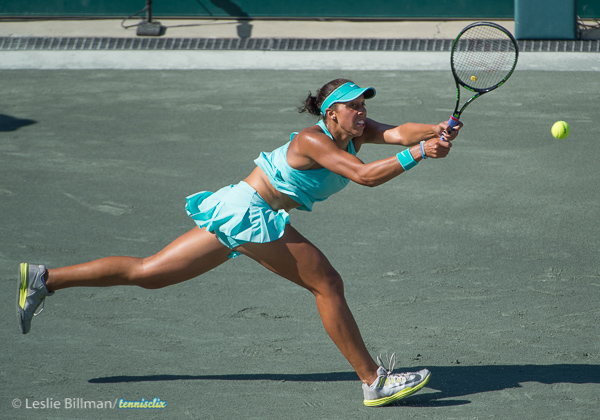 With some of the most powerful groundstrokes on tour – amongst women and men – Keys will present a formidable opposition to Davis’s scrambling efforts. Their match tomorrow will break their head-to-head record of 2-2. None of those matches, however, were played on clay. Keys has only dropped five games this week and has a powerful weapon in her serve, something totally out of range for Davis. In a tournament losing many of its biggest names to upsets and injuries, an all-American battle might be just what the Family Circle Cup needs to come together.